It is definitely engagement ring season! Couples generally pick December and the Holiday season to get engaged. Celebs were no different. Actress Gabrielle Union, Reality TV Star Evelyn Lozada and R&B songstress Ciara are the latest to get engaged this month. But already married Bellyitch Bumpwatch alum Tamar Braxton isn’t getting left behind in the fun. She recently showed off her 14 carat canary diamond ring her husband music producer Vince Herbet gave her for Christmas. Other celebs who got engaged earlier in the end of the year include another bumpwatched mom Kim Kardashian, and MTV’s Whitney Port, Katie Couric, Hayden Panettiere, Glee‘s Naya Riviera and actress Zoe Saldana. For us, it also means possibly more future babies for us to Bumpwatch! yippee! Check out the bling and tell us whose ring is your fave. Kelly Rowland and her boyfriend of 4 years Tim Witherspoon who managed her group Destiny’s Child got engaged and recently confirmed it this month. They got hitched over Skype while she was in Bulgaria but the 4 carat Halo ring he gave her looks real good in person, most likely! Gabrielle Union‘s ring is 8.5 carat diamond ring and given to her by NBA star Dwayne Wade. Kim Kardashian shows off her 15 carat engagement ring from Kanye West. Zoe Saldana’s emerald engagement ring cost an estimated $32,000. The newly wed who got hitched to her fiance Marco Perego in July only just showed off the actual engagement ring on the red carpet to the LACMA Art & Film Gala in LA on November 4.. Reality TV star of MTV’s The City Whitney Port received a rose gold diamond engagement ring inlaid with rows of diamonds from her beau producer Tim Rosenman on November 21, 2013. Glee star Naya Rivera showed off her gigantic ring she received from her hip hop recording artist boyfriend Big Sean at an event in October 3, 2013. Katie Couric had major bling on her ring finger during the 2013 US Open Tennis tournament. The former Today show host who has her own talk show got engaged to her financier boyfriend John Molner over the Labor Day weekend. Nashville star Hayden Panettiere revealed on Live with Kelly and Michael in October that she was engaged to boxer Wladimir Klitschko. Look at that ring! 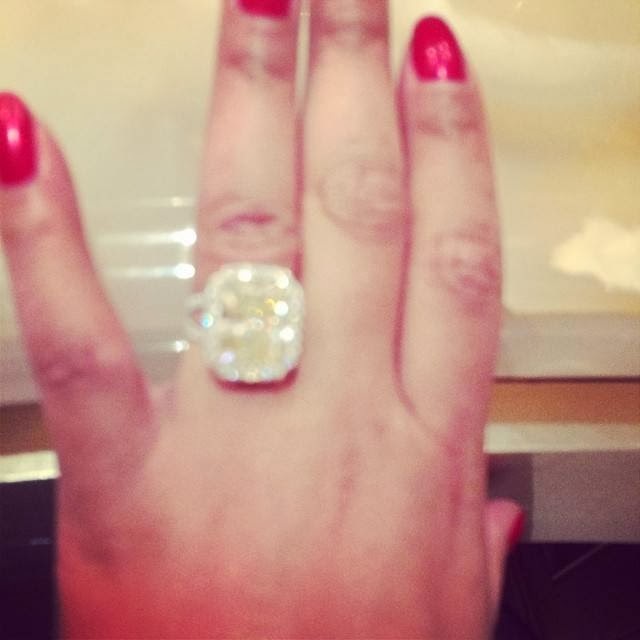 Tamar Braxton Christmas ring is 15 carat canary diamond given to her for Christmas by her hubby Vince Herbert.